Home > Personal Details > Why Shred Personal Documents? With so much emphasis being put on security both in terms of our identity and our finances it is important to ensure that every effort is made to make the identity thief's job as difficult as possible. One way of doing this is to shred all documents that may contain information about you or members of your family which may allow the identity thief to build up a picture of either you as an individual or any other member of your family. There are times when we receive information through the post that has our name and address in more than one place. Such information is normally that sent out by companies who wish us to do business with them or to buy their products and they often enclose questionnaires or order forms which have our names and addresses printed on them. If this is the case it is wise to blacken out the name and address with a heavy marker pen or if the name and address are on a label, pull the label off and dispose of it separately. Shredders are no longer the equipment that was only to be found in the office or workplace. The technology has now become available so that any home owner can pick up a shredder from their local stationers and have it in their home office. A shredder is a cheap and thorough way of ensuring that all the information you want destroyed is destroyed. 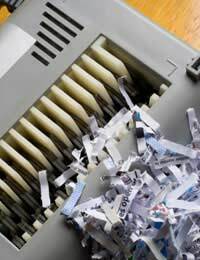 When shredding documentation that may contain personal information it is wise to shred only a few pages at a time thus ensuring they go through the machine without jamming or missing the shred on those important details. Indeed once the paper has gone through the shredder you can - if you feel the need to - burn it on a garden fire or barbecue. The paper can be disposed of normally with your household waste but again it is advisable to put it in a plastic bag and tie it closed and - where possible - place it near the bottom of your bin so that it is disguised with other household waste. In order that you can still do your bit for the environment there are other things you can do with your shredded paper other than simply throwing it away. You could use it for bedding if you have a guinea pig, hamster or rabbit, but you must ensure that all paperclips are removed first and that the shreds are thin and mixed with some straw. The paper can also be left to soak in a bucket of water and used as a mulch or mixed in with a compost heap if you have one, this ensures that the paper breaks down and also that it is used for a more constructive purpose. We have already mentioned blacking out the name and address on any correspondence you are disposing of; it is worth while also doing the same with any account numbers on any paperwork you receive. This not only includes bank account details but also council tax account numbers, home shopping account numbers or online shopping references. It is wise to try - where possible - to make it as hard for the identity thief to succeed as possible.